Is the stress of the holiday season leaving you a little distracted? In the last few weeks of the year, it may seem like there’s a lot more to do and less time to do it. Shopping, getting ready to travel, preparing for guests—it’s truly the time of the year when I don’t just hope for a 25th hour of the day, I hope for a 26th, 27th and 28th! 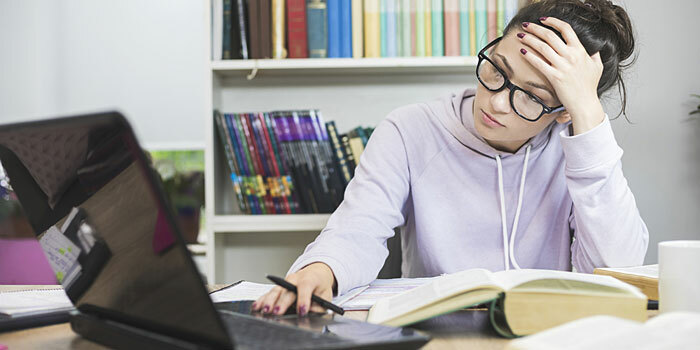 For nursing students, holiday stress can start to impact academic work. Typically, most students can handle a little distraction. They’re nurses after all, and used to being interrupted when they’re trying to get something done. But the holidays seem to add an extra layer of chaos that can leave even the most determined students a little scatterbrained. If you start to feel the pull of holiday preoccupation, here is some advice I often offer to nursing students like you. It’s easy to let the good habits you’ve developed over the year slide a little as your life gets busy, but nip that in the bud early. Exercising, eating well and getting enough sleep will all help you focus. Want proof? A study from Harvard University shows that consistent exercise can contribute to higher levels of concentration. When the frenzy of the season leaves you feeling more like pulling up the covers than pulling out your computer, remember why you enrolled in college in the first place. Whether it’s a love of learning, the accomplished feeling of completing your RN-BSN program, job security or something else entirely, reminding yourself of what you’re working toward can provide a dose of motivation. Sitting down to read for two hours can seem impossible when there’s so much else to do. While you’re studying, if you find your mind drifting toward all the holiday happenings instead of the text in front of you, try a focus sprint. First, set up a no-distraction study space. That means no TV, no kids and no phone. Then set a timer for 20 minutes and get yourself into the mindset to focus. (If your phone is your timer, turn on the do-not-disturb feature and after you’ve set the timer put it face down.) Then start studying. If after the buzzer goes off you are into the assignment, keep going for another 20 minutes. If you’re still distracted, get up and take a break for 10 minutes, then come back. Between work, school and holiday preparations it can seem like there’s no room to breathe. So, create some! Look at your calendar and figure out a week, a day or even an afternoon where you can completely break free of responsibilities. Knowing you have time off coming up can make it easier to concentrate on the school work in front of you. I’m a big proponent of people learning to say, "No." Women, especially, have a hard time doing it. This CNN piece gets right to the heart of it. The end of the year brings plenty of extra responsibilities. Extra parties. Extra fundraisers and charity drives. Extra travel. If these additions are crowding into your study time and pushing you off your graduation goal, it’s time to start saying, "No." Think about one to three commitments that are very important to you and commit to those, then turn down the rest. Part of the reason it’s so hard to concentrate during the last few weeks of the year is the combination of excitement and stress. You might also start to think about the coming of a new year; a time of renewal that is just around the corner and tell yourself you’ll buckle down then. But, the best gift you can give yourself is to focus on today – the reading you have to do and assignments to finish. Doing that work now will help you enjoy the celebrations later, and set you up for your best possible start when the calendar year changes. Sometimes a little reward is just the boost you need to help you keep going. Set small goals for yourself and then give yourself a treat for getting them done. The positive reinforcement will hit refresh on your interest dial! Your friends and family can be fantastic for holding you accountable. Think of the people in your life who are the most dedicated or motivated. Call on them when you’re feeling distracted for an extra dose of incentive. Or, you can reach out to me! I’m always happy to offer more advice on how to focus or simply give you a pep talk. No matter how you’re celebrating this holiday season, I wish you the very best. Good luck with your studies and I’ll see you in 2018!